COLUMBIA, Mo. (AP) — Authorities have arrested a man suspected of filming patrons of a Columbia library in a bathroom and fleeing to Iceland. REYKJAVIK, Iceland (AP) — Thirty years ago, a sobering dry spell in Iceland's history came to an end. REYKJAVIK, Iceland (AP) — U.S. Secretary of State Mike Pompeo wrapped up a five-nation tour of Europe in Iceland on Friday after the Trump administration launched a scathing attack on the European Union over its approach to Iran. AKUREYRI, Iceland (AP) — Police in Iceland have a warning for visitors: Beware our roads in the winter. COLUMBIA, Mo. (AP) — Federal investigators believe a man charged with filming patrons in a Columbia Public Library restroom has fled to Iceland. REYKJAVIK, Iceland (AP) — An SUV carrying seven people from two British families plunged off a bridge Thursday in Iceland, killing three people and critically injuring the others, authorities said. Icelandic police said one child was among the dead and two, aged 7 and 9, were among the injured. Police initially said the injured were from one family but updated the information later. MYVATN, Iceland (AP) — The people of northern Iceland have had their travel plans disrupted with a record high snowfall this December. Roads have been shut, flights cancelled and school suspended. But for the children of this isolated North Atlantic island nation, the main worry is how the waist-high snow might affect the Icelandic Santa, Stekkjastaur, who comes to town Wednesday. DOHA, Qatar (AP) — Iceland's coach at the World Cup has been hired by Qatari soccer club Al-Arabi. The club announced the move in a video on its Twitter account , saying part-time dentist Heimir Hallgrimsson will attend a news conference Tuesday. It's the first coaching job outside Iceland for the 51-year-old Hallgrimsson, who left the national team after its group-stage elimination in Russia. BRUSSELS (AP) — Michy Batshuayi proved a more than capable replacement for the injured Romelu Lukaku on Thursday when he scored twice as Belgium beat Iceland 2-0 to maintain its 100 percent record in the inaugural UEFA Nations League. After 65 minutes of pounding the Iceland defense, captain Eden Hazard found Thomas Meunier on the right and the Paris Saint-Germain winger crossed for Batshuayi to slot the ball home. REYKJAVIK, Iceland (AP) — For those hoping for ever cheaper fares on long-haul flights, this month's takeover of Icelandic airline Wow is not good news. The struggling airline, which specializes in ultra-cheap flights between North America and Europe, was taken over by Iceland's flagship carrier, Icelandair, for just $18 million. Its rescue is a reality check for an industry hoping to apply the budget flying model to long-haul routes. MIAMI (AP) — Hurricane Oscar is weakening but still producing high surf along Bermuda's beaches as it speeds north over the Atlantic Ocean. Forecasters at the National Hurricane Center in Miami say Oscar was centered Wednesday morning about 805 miles (1,300 kilometers) east-northeast of Bermuda with top sustained winds of 75 mph (120 kph). MIAMI (AP) — Hurricane Oscar is expected to produce high surf conditions along Bermuda's beaches as it moves north in the Atlantic Ocean. Forecasters at the National Hurricane Center in Miami said Oscar was centered about 470 miles (755 kilometers) east southeast of Bermuda on Tuesday morning with top winds of 105 mph (165 kph). The storm was moving north at about 13 mph (20 kph). The hurricane center says hurricane-force winds extend outward up to 15 miles (30 kilometers) from the center. PORTLAND, Maine (AP) — A Maine university has signed an agreement with a pair of Icelandic schools about collaborating on a new degree program in ocean food systems. The University of New England says it signed the agreement with University of Akureyri and Holar University College at the Arctic Circle Assembly in Reykjavik, Iceland. AUGUSTA, Maine (AP) — Republican Gov. Paul LePage says he'll lead a delegation of 40 Mainers to Iceland for a dialogue on the Arctic's future. LePage's office said he'll meet Saturday with Iceland's Minister of Foreign Affairs Gudlaugur Thor Thordarson. LePage says the delegation signals Maine's commitment to strengthening relationships in the Arctic. The two will re-sign a memorandum of understanding between Iceland and Maine on topics from trade, to energy, to culture and the arts. MADRID (AP) — It was an odd scene at Benito Villamarin Stadium in Seville: The few visiting English fans were chanting "Ole" at every touch of the ball by their squad, while the home Spanish crowd was jeering its own players. It was only halftime on Monday and the Spaniards had already seen their national team concede three goals for the first time ever in a competitive match at home. By the end, they were witnesses to La Roja's first home loss in 15 years. REYKJAVIK, Iceland (AP) — The Lehman Brothers bankruptcy threw the United States into an epoch-defining financial storm. Imagine 300 of them going bust at once. That, in relative terms, is what Iceland endured a decade ago during its banking crisis, which on this rugged island steeped in myths of gods and giants is now known as "hrunid" — the collapse. SHREVEPORT, La. (AP) — A sculptor from Iceland will be at a Louisiana college in the upcoming week to guide visitors through her outdoor sculpture series called Borders. Eleven pairs of life-sized androgynous human figures were installed around Centenary College in Shreveport in early October. They'll remain through the school year. GUINGAMP, France (AP) — Kylian Mbappe saved world champion France's blushes by creating one goal and scoring a late equalizer in the space of five minutes to salvage a 2-2 draw against Iceland in a friendly on Thursday. But Mbappe, who went on as a substitute for the last half an hour, was the home team's savior. PARIS (AP) — Marseille winger Dimitri Payet was called up Monday by France coach Didier Deschamps for upcoming matches against Iceland and Germany as a replacement for the injured Nabil Fekir. Payet missed the World Cup because of injury and has not played with the national squad since a 2-1 win over Belarus in qualifying last October. LEICESTER, England (AP) — Iceland playmaker Gylfi Sigurdsson produced a contender for English Premier League goal of the season to help Everton beat 10-man Leiceser 2-1 on Saturday. Sigurdsson collected Idrissa Gueye's pass before a quick turn away from Leicester's James Maddison allowed him to take a touch and unleash a bullet from 25 yards into the top corner of the net. PARIS (AP) — Lyon midfielder Tanguy Ndombele has been called up by France for the first time for this month's friendly against Iceland and UEFA Nations League match against Germany, while defender Mamadou Sakho is back for the world champions after a 2 ½ year absence. The 21-year-old Ndombele has impressed for his club this season and replaces Corentin Tolisso, who could be sidelined up to six months with a knee injury. BERLIN (AP) — Iceland striker Alfred Finnbogason kept with tradition by scoring a hat trick for Augsburg in its 4-1 win against Freiburg in the Bundesliga on Sunday. Finnbogason, who scored against Argentina in Iceland's debut at this year's World Cup, also got a hat trick in the 3-3 draw between Augsburg and Freiburg last season. MADRID (AP) — Luis Enrique couldn't have asked for a much better start as coach of Spain's national team. Two matches, two convincing wins against top opponents in the UEFA Nations League. Spain followed its gritty 2-1 win against England at Wembley Stadium last week with a 6-0 rout of World Cup runner-up Croatia on Tuesday, keeping Enrique perfect since taking over as La Roja's coach. HORNSTRANDIR, Iceland (AP) — The passenger boat arrives at the bottom of Veidileysufjordur, a short inlet with a long name, to drop off backpackers for a multi-day trek. 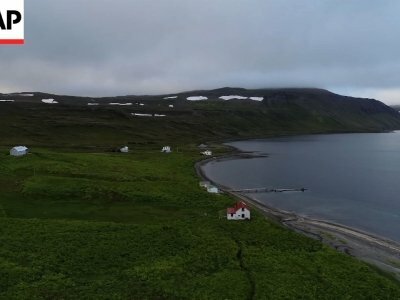 A weather-beaten group that's completed the trip waits to board, eager to get back to a part of Iceland where they can reconnect with the world via Wi-Fi. BERN, Switzerland (AP) — Young Boys players Djibril Sow and Kevin Mbabu have been named in Switzerland's squad to play Iceland and England ahead of their Champions League debuts. Sow, a 21-year-old midfielder, and Mbabu, a 23-year-old defender, are also preparing to play Juventus and Manchester United after helping Young Boys win a first Swiss title for 32 years. LONDON (AP) — Icelandic actor Stefan Karl Stefansson, who played villain Robbie Rotten in the children's TV series "LazyTown," has died of cancer. He was 43. The actor's wife, Steinunn Olina Thorsteinsdottir, announced on Facebook that he died Tuesday. STOCKHOLM (AP) — South African soccer club Mamelodi Sundowns says former Sweden coach Erik Hamren has been released from his contract to take over Iceland's national team. Swedish Radio says Hamren, who coached Sweden's national team from 2009-16 and worked as technical director for the Sundowns, will be presented on Wednesday in Reykjavik. The Iceland soccer federation would not confirm the report. MOUNTAIN, N.D. (AP) — The small northeastern North Dakota town of Mountain is holding its annual Icelandic heritage celebration this weekend. The 119th Deuce of August festival is expected to attract a few thousand visitors, including Iceland Prime Minister Katrín Jakobsdóttir. Gov. Doug Burgum welcomed Jakobsdóttir to the festival on Saturday. His office says she is the fifth sitting prime minister of Iceland to attend the Deuce of August celebration since 2005. LONDON (AP) — One of Iceland's top whaling companies says it has stopped hunting minke whales this year, in response to a new government regulation that enlarged the protected area for baleen whales. The temporary halt to whaling comes about a month earlier than expected, Gunnar Jonsson, owner of whaling company IP-Utgerd Ltd said Thursday. A New England ocean science center says whale watchers off Iceland caught an extremely rare glimpse of an endangered right whale near their country. The North Atlantic right whale was spotted northwest of Reykjavik (RAY'-kyuh-vik) on Monday. The Anderson Cabot Center for Ocean Life at the New England Aquarium in Boston says there have been only three North Atlantic right whales identified off Iceland in the last 30 years. NYON, Switzerland (AP) — Dropped into Europa League qualifying rounds by AC Milan's reprieve, Atalanta has been drawn against an opponent in Israel or Iceland if it first beats Sarajevo. Atalanta was in the group stage until Milan's win at the Court of Arbitration for Sport on Friday overturned an expulsion by UEFA for breaking financial monitoring rules. A leading figure in the U.S. white nationalist movement said Friday that he was briefly detained in Iceland this week and had to return home before he could speak at a conference in Sweden. Richard Spencer told The Associated Press that he was traveling from Maryland to Sweden on Tuesday when Iceland authorities stopped him at the Reykjavik airport. He said he was detained at the airport for roughly three hours before he flew back to the U.S. on Wednesday.